The design details were largely informed by research into early industrial designs from the 50’s and 60’s and vintage cycle styling. This era was the beginning of industrial design as a profession and, in the post war world, mechanical equipment was being designed to be more appealing in a household environment. Manufacturers wanted to appeal to woman in order to get their products into homes. Thus there was a fluidity or softness in many of the designs. Later, designs also became influenced by the space age and had a clear ‘tech’ vibe. It is this contrast between ‘tech’ and curvaceousness that informed our design. We looked more specifically at Italian mid-century diners as a way to combine classic Italian and mechanical references; drawing inspiration from a period in design that was rich with possibility. 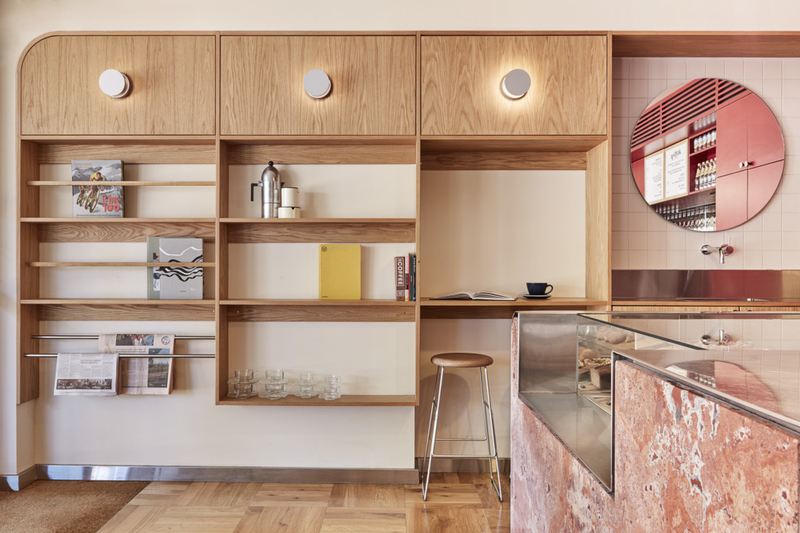 The counter is formed from folded stainless steel wrapping a Persian Red Travertine front. In this way the small venue looks less cluttered through the consistency of steel surfaces and retains a functional, technical feeling in contrast to soft finishings and curved lines of the seating area. Willing coffee accommodates an extensive list of ‘must haves’ into a small space. The venue is intentionally tight on seating, increasing familiarity, but maintains a clean aesthetic that tells the story of the family that run it.